Dola Jikmé Kalzang (Tib. རྡོ་བླ་འཇིགས་མེད་སྐལ་བཟང་, Wyl. rdo bla 'jigs med skal bzang) aka Chökyi Lodrö (ཆོས་ཀྱི་བློ་གྲོས་, chos kyi blo gros) and Shyönnu Yeshe Dorje (gzhon nu ye shes rdo rje) (b. 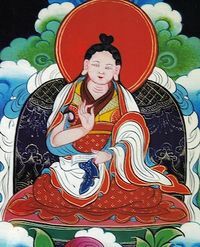 1789) — a disciple of the first Dodrupchen, Jikmé Trinlé Özer, Dola Jikmé Kalzang recognized Patrul Rinpoche as the incarnation of Palge Lama. He gave many Nyingma transmissions, including the Longchen Nyingtik, on behalf of Dodrupchen. Tulku Thondup recounts how he sacrificed his life out of compassion for a thief about to executed in China. Among his incarnations was Yukhok Chatralwa Chöying Rangdrol. Tulku Thondup, Masters of Meditation and Miracles, Shambhala, 1999, pages 173-174.